One of our most popular courses, the solo diver program teaches experienced recreational divers how to safely dive independently of a dive buddy or strengthen your buddy team skills. The course stresses on proper dive planning, personal limitations, accident prevention as well as the benefits, hazards, and proper procedures for diving solo. 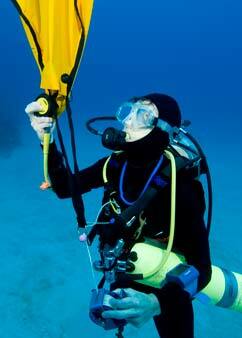 You will also learn the additional equipment that is required for solo diving including it's proper usage and assembly. This is the prefect course for underwater photography and underwater video divers as well as anyone who cannot be sure of having an attentive buddy at all times. Read the Solo Diving Manual and answer the Quick Quiz questions before the seminar. Attend the Solo Diver Seminar, where we will review the Quick Quiz and discuss the skills, equipment and planning involved in Solo Diving. Do two open water dives where you will practice the skills. Expect to do one dive with a pony bottle and one with double tanks supplied as part of the class. 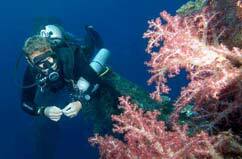 Upon successful completion you will recieve SDI Solo Diver certification.